The startup form is the first form that is launched when your application is executed. By default, a Windows Forms project creates a default form when the project is created. This form is set as the startup form. You can change the startup form to any form within your application following the steps below. In this example, the report form is set as the startup form for testing purposes. 1) Double-click on My Project under the project in Solution Explorer. 2) Click the Application tab. 3) Set the Startup form. Use this technique any time you want to change the start up form for the application. A common question on the forums is how to use the Enter key instead of the Tab key to move through the controls on a Windows form. One common approach is to use SendKeys to send a Tab. But here is another option. NOTE: To use this technique, set the KeyPreview property of the form to True. This code first checks the key that was pressed down and if it was the Enter key, processes it. It uses the GetNextControl method to find the next control in the tab order. It checks the Shift key and if the Shift key is also pressed, GetNextControl finds the prior key in the tab order. If GetNextControl does not find another control (because it runs into the end of the tab order), it calls GetNextControl again passing in a null to start back at the other end of the tab order. For example, if you have four TextBoxes: 1,2,3,4, pressing the Enter key will move you from 1 to 2 to 3 to 4 and then back to 1. Pressing Shift + Enter will move you from 4 to 3 to 2 to 1. Use this technique any time your users want to use the Enter key instead of the Tab key to move through the controls on a Windows form. There are endless numbers of details you have to contend with when building great software. So it is easy to forget about some of the small ones, especially when it comes to the UI. So I use a checklist like this one to help ensure I covered all of my bases. Use this checklist as you finish each one of your WinForm UI components so you don’t have to sweat the details. Sometimes you want to add a little color to your WinForms controls. WinForms comes with a large set of named colors that you can use. NOTE: Be sure to import a reference to System.Drawing. But what if you want to display a color that is not one of the named colors? Then you can use the Color.FromArgb method to define your color by specifying the red, green, and blue values. Ah, but what if you have the color defined as a hexadecimal value? Well, you could use Bing/Google to find a converter to convert it to RGB. Or you can use the ColorTranslator.FromHtml method. Use any of these techniques to add some color to your WinForms applications. 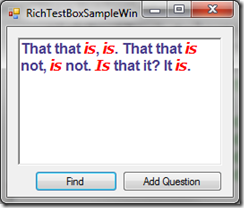 If you are building a WinForms application and want to style your text, you may want to use the RichTextBox control instead of the standard TextBox control. This post provides some of the common techniques required to style text in a RichTextBox control. 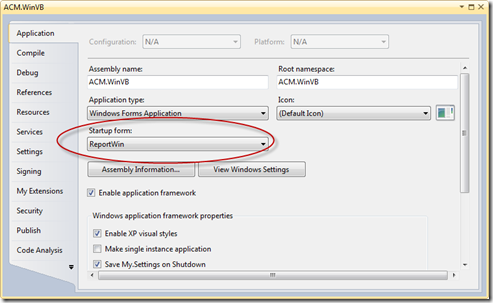 To try out the examples in this post, build a new WinForms application. 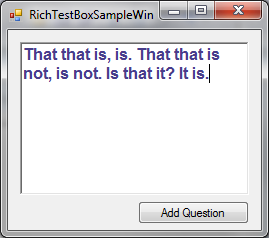 If desired, change the name of the form to "RichTextBoxSampleWin". Add a RichTextBox and two buttons to the form. To set the fonts and colors of a RichTextBox, always select the text to style first, then set its font and color. richTextBox1.Text = "That that is, is. That that is not, is not. " "Is that it? It is." 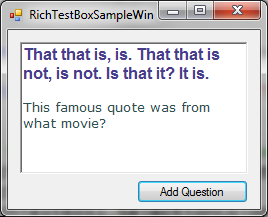 The first line of code sets text into the RichTextBox. The most important step here is to select the text that you want to style. Use the SelectionStart property to set the location in the text string to start the selection. If you don’t specify a selection start, it is assumed to start at the first character of the text. Use the SelectionLength property to specify the length of the selection. In this case, the entire length of text is selected to be styled. NOTE: Instead of setting the SelectionStart and SelectionLength properties, you can use the Select method to set both the selection start and selection length at one time. The next two lines set the font and color for the selected text. The last line resets the SelectionStart to the end of the text. This allows the user to type in further text. If the user types in more text, it will follow the given style. Add the text by appending to the Text property and then use SelectionStart and SelectionLength to select the appended text. Then style the selected text. This is similar to the approach used above. Set the styles and then use the AppendText property. "This famous quote was from what movie?" This code first stores the length of the current text. This will be the selection start value. 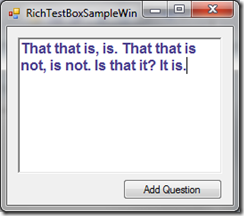 The additional text is then appended to the Text property of the RichTextBox. The SelectionStart and SelectionLength are then set as in the prior example. Finally, the font and color are set. NOTE: You must set the SelectionStart and SelectionLength after you append the text. Notice how much shorter this option is. 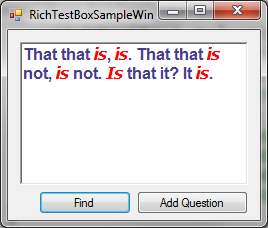 This technique sets the SelectionFont and SelectionColor and then uses the AppendText method to add the styled text to the RichTextBox. Another common requirement when working with a RichTextBox is to highlight multiple occurrences of a specific word. Dim wordToFind As String = "is"
The code first defines the word to find. If this code is contained in a method instead of an event, the word to find could be passed in as a parameter. 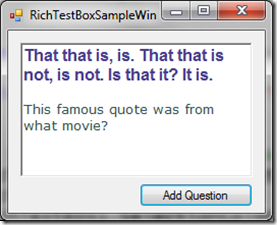 The code then loops through the text in the RichTextBox using the Find method of the RichTextBox to find the next occurrence. The Find method will return –1 when it does not find any matches. If a match is found, the code uses the Select method to select the found text. It then sets the font and color. This example also demonstrates how to bold AND italicize the text by Or’ing the style flags.